It was love at first sight when I saw this rhinestone studded tie in the window of a specialty men’s store in Venice, Italy. I didn’t buy it because it cost nearly $200! Instead, I created it myself. You can too, for just a little more than $20. Any dark color will give great contrast to the crystal stones. I made one in black and one in sapphire blue and they’re equally eye-catching. step 1 - Download the free tie template and follow the instructions on the page for joining the 3 template pieces. 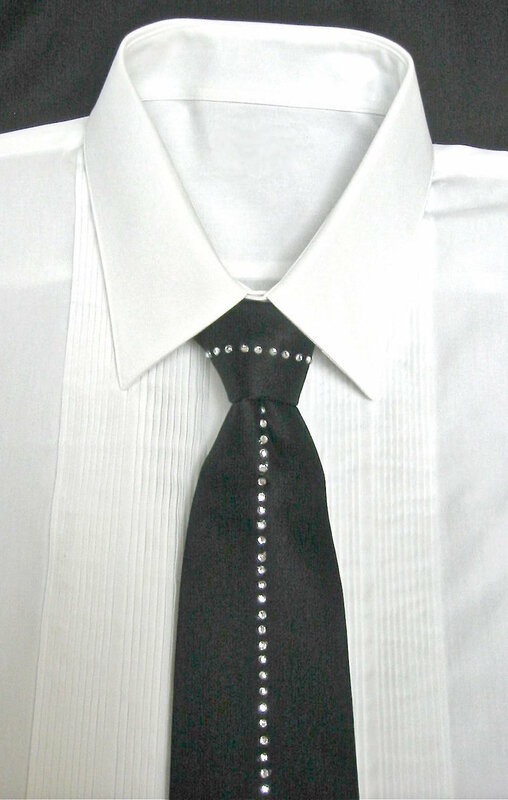 The template is designed to simplify the positioning of rhinestones on the tie. step 2 - Place a hard work surface (like a cutting board), on an ironing board. Match up the large angled edge of the tie with the angled edge of the template, making sure the center of the template matches the center of the tie. Use painter’s tape to secure only the very outer edges of the template and tie to the work surface so it doesn’t shift. step 3 - Using thin nose tweezers/pliers, position 3MM hot fix rhinestones in the template gutter between the 83 sets of grey lines. My first choice for attaching the stones is a rhinestone applicator. If you own one, you don’t need to read further. But if you don’t, continue following the instructions. step 4 - Place a cloth over the stones, being careful not to move any of them in the process. Follow the hot fix rhinestone directions for applying. This usually amounts to moving the setting of your iron to “cotton” and turning off the steam. Press down with the iron for 45 seconds. Do not apply the iron on the painter’s tape as the tape adhesive will melt. Also, do not move the iron while it is set on the rhinestones. Let cool then repeat for 45 seconds. Let cool, then remove the tape and template and turn the tie over. Cover again with the cloth and press down on the center of the tie with the iron for another 30 seconds. step 5 - Let cool for 20 minutes. Before attempting this project, test the pressing directions as outlined in step 4 on a small portion of the back side of the tie to be sure the heat of the iron will not damage the fabric. A pressing cloth should prevent any damage. My tie was silk and was not damaged in any way by the heat or the rhinestone application process. Painters tape, when lightly applied, is generally easy to remove and won’t leave residue on the delicate tie fabric. But fabrics vary, so I recommend testing the tape on the underside of the tie before starting this project. I do not recommend masking tape.